The Rotring 600 mechanical pencil is a classic icon in the pantheon of writing instruments. In recent times Rotring released a new pencil which has some similarities to the venerable 600. I refer of course to the Rotring Rapid Pro mechanical pencil. Back in June last year I held a giveaway on this blog for a Rapid Pro, and now it’s time for a review…well actually more than one review, and all three of them are guest reviews…a trifecta of Rotring champions, if you like. So, here we have the Rotring Rapid Pro family of mechanical pencils - 0.5mm, 0.7mm and 2.0mm, all stylistically the same. The 2mm is a ratchet advance mechanical pencil just like the others. It’s not a clutch pencil. 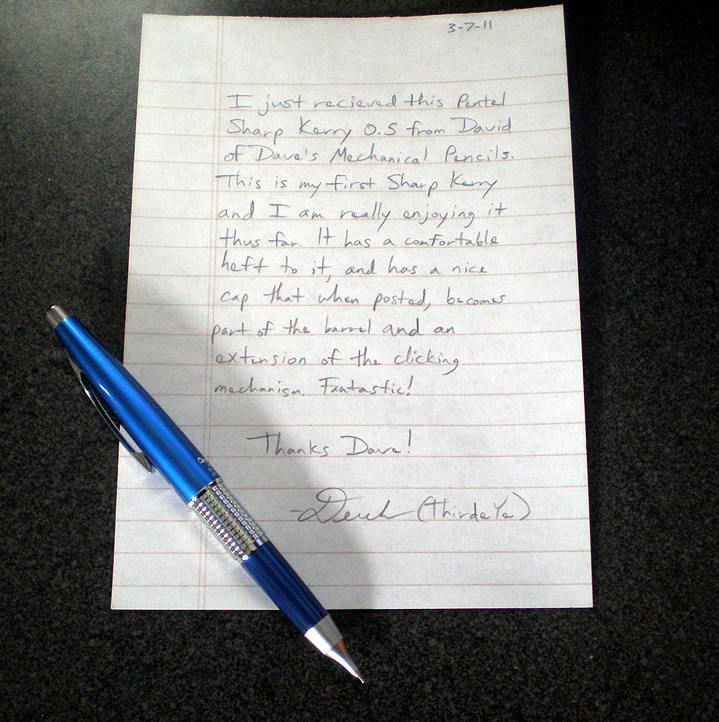 The winners of my giveaway were Spuddybuddy and Rhonda Eudaly so I present their two reviews here, and the third triumvir is none other than Ovidiu who previously reviewed the mighty Rotring 600 here on this blog. We shall see what he has to say about its new brother, the Rapid Pro. We will start the tri-review with Spuddybuddy, and in a first for DMP we have a video review. Yep, no more reading, just sit back, get comortable and enjoy the Spuddybuddy Rotring Rapid Pro Movie below. Well then, now for a more traditional review, here we have Ovidiu's written review. The Rotring Rapid Pro is the newest release from the Hamburg based company, part of Sanford, who is also part of Newell Rubbermaid Company. And unlike the Rotring 600 or Rotring 800, officially available only in Japan, the Rapid Pro seems to have worldwide availability and also can be seen on Rotring homepage and also Rotring Catalog from 2010. I really commend Rotring for this bold decision to release, after so many years, a high quality mechanical pencil, that is, as they say, “the perfect professional tool for all sketching, writing and drawing applications”. We really needed a comeback from Rotring. There are three versions of Rotring Rapid Pro available, the 0.5mm, 0.7mm and 2mm and there is only one color available so far, silver, for all of them. The nice thing about the 2mm model is that it features an automatic mechanical pencil mechanism, rather than the standard clutch mechanism usually found in the classic leadholders. 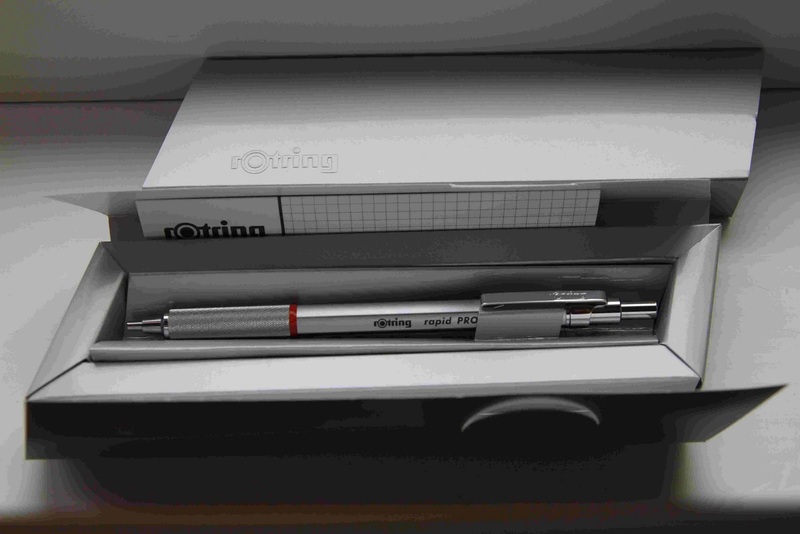 The packaging consists from a grey cardboard box that slides into another which has the word “Rotring” embossed on it. You receive a lot more “package” than with the Rotring 600 for example. 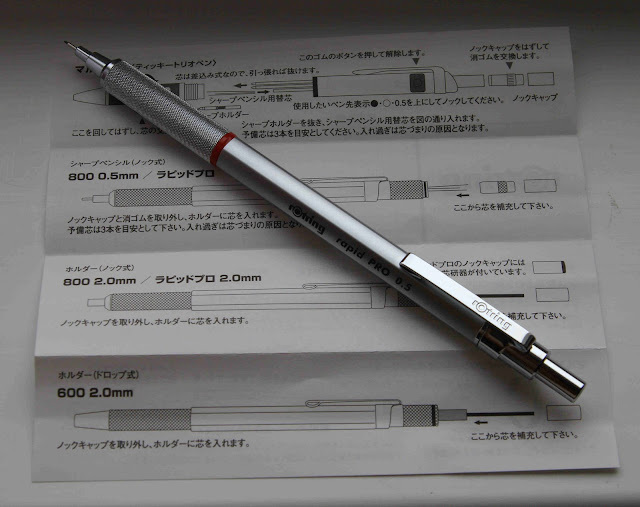 Of course, no true professional mechanical pencil comes without the mandatory user manual, in fact a folded sheet of paper, which, in this case, doesn’t refer to the Rapid Pro at all, but to it’s Japanese relatives, Rotring 800 and 600. This could be to the fact the pencil was bought from Japan and it’s quite possible that this manual could differ for other countries. For sure, the Rotring Rapid Pro is a very nice pencil. Almost all the body is made of brushed metal, with some shiny polished surfaces on the tip of the pencil and the pocket clip. I usually don’t like shiny surfaces on pencils, especially on drafting pencils that I always consider should look more “serious” than the regular ones, but on the Rapid Pro, those touches really look good. The name alone suggests a resemblance with the Rotring Rapid, an interesting, plastic body / rubber grip pencil with a “vanishing point” mechanism and a very long eraser hidden under the cap. But in the end, these two pencils don’t have too much in common, besides the fact that both are pocket safe. 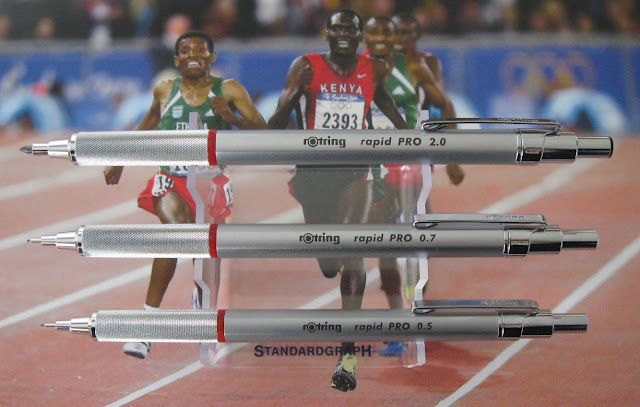 The Rapid Pro looks more like a Rotring 600 relative than Rapid’s one. The Rapid Pro is a very solid, well-made pencil. Writing with it I didn’t fell any play in the parts of the mechanism, which is quite rare these days, even with “pro” pencils. The grip is standard for a drafting pencil with a laser cut diamond like pattern. As you can see from the picture, the grip’s texture is much denser than the one from Rotring 600 and this really feels in use, especially if your fingers get a little sweaty, the Rapid Pro tends to slip much easier. 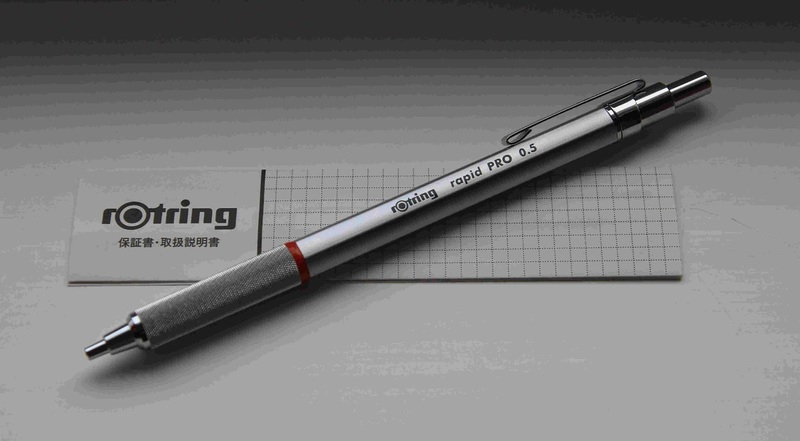 Unlike the Rotring 600, Rapid Pro uses a so called sliding sleeve, which can be hidden inside the body for pocket safety, when the pencil is not in use. This is in fact not the only advantage of this kind of mechanism, because on long writing sessions the sleeve cushions inside the body while the lead consumes itself so this way you don’t need to push the pencil’s cap that often to advance the lead. The sleeve’s length is around 3mm and seems pretty sturdy, without too much play. ﻿The pocket clip looks the same as the one found in Rotring 600, only this time it is polished and shiny. It is also removable. The cap is also polished and has a small hole on top of it. The eraser is probably identical to the one in Rotring 600… small but functional if you have nothing else on hand. It sits on top of the lead magazine, which is made of metal. The mechanism is a standard, automatic one, pushing the button the lead is advancing in small steps. The click is a quiet but audible one. Ten clicks will give you around 7mm of lead, just like with the Rotring 600. As you can see there is a fair amount of plastic used. I was writing with the Rapid Pro for about one month and the impressions are mostly positive, but this should be expected since it resembles in many ways the Rotring 600. The grip is just a little thicker which is good, the sliding sleeve is a very nice and useful addition, since it helps you keep up in long writing sessions without the need to push the button to advance the lead. The build quality is as expected – very good, as it should be on an instrument of this kind. 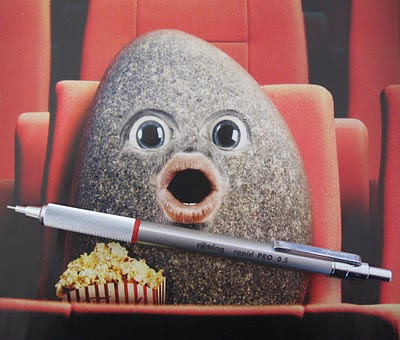 In the end, probably the greatest thing is that Rotring finally re-opened to the world and decided to continue their rich tradition in producing high quality writing instruments. Not so good points : Rotring was a little overzealous with the grip and barrel, a little too slippery for my liking. Thickness : 8mm (the barrel – between the points), 8mm for the grip. Last then, but not least, we have the third part of our tri-review. It's by Rhonda Eudaly and is posted on her own blog. So, no point in duplicating here, this is the link to Rhonda’s Rotring Rapid Pro mechanical pencil review. Head over for a browse. Well, that’s about it. I think we are all Rotring Rapid Pro’d out. It’s a fine pencil, a worthy addition to the Rotring stable…but will it reach the status of the 600…time will tell. Please join with me in thanking all three guest reviewers for their sterling efforts, and wish them many years of Rapid Pro enjoyment. Follow up article on Rotring Rapid Pro 2mm mechanical pencil. Well the various Dave Turns Five giveaway prizes departed DMP HQ a while ago and reports of their arrival at destination are starting to filter back in. Here are two giveaways that are in the hands of their new owners. First, the Pentel Sharp Kerry mechanical pencil won by “ThirdeYe”. You can read more of what ThirdeYe has to say about the Sharp Kerry over on his blog. Second we have the Conway Stewart Nippy No. 3 pencil won by “Economy Pens”. Here it is shown in its new home. You can read more on Economy Pens blog. So, Stell, you've got 48 hours or so to get in touch with me. Send me an email by using the address in the sidebar "About Me - View My Complete Profile". It's all over. The final giveaway has closed and the random number generator on my old Casio fx-82TL calculator has selected xMisoSoupx as the winner. So, please down your soup and send me an email by using the address in the sidebar "About Me - View My Complete Profile". Thanks to all of you who have enetered into the various giveaways, sorry I could give you all a prize. xMisoSoupx - it's been over 48hrs and I haven't heard from you...time's running out.